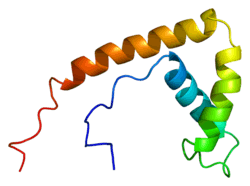 High mobility group box 1 protein, also known as high-mobility group protein 1 (HMG-1) and amphoterin, is a protein that in humans is encoded by the HMGB1 gene. HMG-1 belongs to high mobility group and contains HMG-box domain. Like the histones, HMGB1 is among the most important chromatin proteins. In the nucleus HMGB1 interacts with nucleosomes, transcription factors, and histones. This nuclear protein organizes the DNA and regulates transcription. After binding, HMGB1 bends DNA, which facilitates the binding of other proteins. HMGB1 supports transcription of many genes in interactions with many transcription factors. It also interacts with nucleosomes to loosen packed DNA and remodel the chromatin. Contact with core histones changes the structure of nucleosomes. The presence of HMGB1 in the nucleus depends on posttranslational modifications. When the protein is not acetylated, it stays in the nucleus, but hyperacetylation on lysine residues causes it to translocate into the cytosol. HMGB1 has been shown to play an important role in helping the RAG endonuclease form a paired complex during V(D)J recombination. HMGB1 is secreted by immune cells (like macrophages, monocytes and dendritic cells) through leaderless secretory pathway. Activated macrophages and monocytes secrete HMGB1 as a cytokine mediator of Inflammation. Antibodies that neutralize HMGB1 confer protection against damage and tissue injury during arthritis, colitis, ischemia, sepsis, endotoxemia, and systemic lupus erythematosus. The mechanism of inflammation and damage is binding to TLR4, which mediates HMGB1-dependent activation of macrophage cytokine release. This positions HMGB1 at the intersection of sterile and infectious inflammatory responses. HMGB1 has been proposed as a DNA vaccine adjuvant. HMGB1 has to interact with P53. HMGB1 is an intracellular protein that can translocate to the nucleus where it binds DNA and regulates gene expression. It can also be released from cells, in which extracellular form it can bind the inflammatory receptor RAGE (Receptor for Advanced Glycation End-products）. Release from cells seems to involve two distinct processes: necrosis, in which case cell membranes are permeabilized and intracellular constituents may diffuse out of the cell; and some form of active or facilitated secretion induced by signaling through the NFkappaB. HMGB1 can interact with TLR ligands and cytokines, and activates cells through the multiple surface receptors including TLR2, TLR4, and RAGE. Among the receptors of amphoterin includes toll-like receptors. Interaction of HMGB1 and TLR4 results in upregulation of NF-kappa B , which leads to increased production and a release of cytokines in macrophages and in neutrophils for example stimulates release ROS via TLR-dependent activation of NADPH oxidase. HMGB1-LPS complex activates TLR4, and leads to binding adapter proteins (MyD88 and others), which leads to signal transduction and activate signaling cascades. In the last line leads to activation of MAPK cascades and NF-kappa B and thus to the production of cytokines and other inflammatory molecules. HMGB1 has been proposed as a target for cancer therapy. ↑ Ferrari S, Finelli P, Rocchi M, Bianchi ME (July 1996). "The active gene that encodes human high mobility group 1 protein (HMG1) contains introns and maps to chromosome 13". Genomics. 35 (2): 367–71. doi:10.1006/geno.1996.0369. PMID 8661151. ↑ Chou DK, Evans JE, Jungalwala FB (April 2001). "Identity of nuclear high-mobility-group protein, HMG-1, and sulfoglucuronyl carbohydrate-binding protein, SBP-1, in brain". J. Neurochem. 77 (1): 120–31. doi:10.1046/j.1471-4159.2001.t01-1-00209.x. PMID 11279268. ↑ Bianchi ME, Agresti A (October 2005). "HMG proteins: dynamic players in gene regulation and differentiation". Curr. Opin. Genet. Dev. 15 (5): 496–506. doi:10.1016/j.gde.2005.08.007. PMID 16102963. 1 2 3 4 Klune JR, Dhupar R, Cardinal J, Billiar TR, Tsung A (2008). "HMGB1: endogenous danger signaling". Mol. Med. 14 (7-8): 476–84. doi:10.2119/2008-00034.Klune. PMC 2323334 . PMID 18431461. ↑ Wang H, Bloom O, Zhang M, Vishnubhakat JM, Ombrellino M, Che J, Frazier A, Yang H, Ivanova S, Borovikova L, Manogue KR, Faist E, Abraham E, Andersson J, Andersson U, Molina PE, Abumrad NN, Sama A, Tracey KJ (July 1999). "HMG-1 as a late mediator of endotoxin lethality in mice". Science. 285 (5425): 248–51. doi:10.1126/science.285.5425.248. PMID 10398600. ↑ Yang H, Hreggvidsdottir HS, Palmblad K, Wang H, Ochani M, Li J, Lu B, Chavan S, Rosas-Ballina M, Al-Abed Y, Akira S, Bierhaus A, Erlandsson-Harris H, Andersson U, Tracey KJ (June 2010). "A critical cysteine is required for HMGB1 binding to Toll-like receptor 4 and activation of macrophage cytokine release". Proc. Natl. Acad. Sci. U.S.A. 107 (26): 11942–7. doi:10.1073/pnas.1003893107. PMC 2900689 . PMID 20547845. ↑ Yang H, Tracey KJ (2010). "Targeting HMGB1 in inflammation". Biochim. Biophys. Acta. 1799 (1-2): 149–56. doi:10.1016/j.bbagrm.2009.11.019. PMID 19948257. ↑ Fagone P, Shedlock DJ, Bao H, Kawalekar OU, Yan J, Gupta D, Morrow MP, Patel A, Kobinger GP, Muthumani K, Weiner DB (November 2011). "Molecular adjuvant HMGB1 enhances anti-influenza immunity during DNA vaccination". Gene Ther. 18 (11): 1070–7. doi:10.1038/gt.2011.59. PMID 21544096. ↑ Imamura T, Izumi H, Nagatani G, Ise T, Nomoto M, Iwamoto Y, Kohno K (March 2001). "Interaction with p53 enhances binding of cisplatin-modified DNA by high mobility group 1 protein". J. Biol. Chem. 276 (10): 7534–40. doi:10.1074/jbc.M008143200. PMID 11106654. ↑ Dintilhac A, Bernués J (March 2002). "HMGB1 interacts with many apparently unrelated proteins by recognizing short amino acid sequences". J. Biol. Chem. 277 (9): 7021–8. doi:10.1074/jbc.M108417200. PMID 11748221. ↑ Sims GP, Rowe DC, Rietdijk ST, Herbst R, Coyle AJ (2010). "HMGB1 and RAGE in inflammation and cancer". Annu. Rev. Immunol. 28: 367–88. doi:10.1146/annurev.immunol.021908.132603. PMID 20192808. ↑ Park JS, Gamboni-Robertson F, He Q, Svetkauskaite D, Kim JY, Strassheim D, Sohn JW, Yamada S, Maruyama I, Banerjee A, Ishizaka A, Abraham E (2006). "High mobility group box 1 protein interacts with multiple Toll-like receptors.". Am J Physiol Cell Physiol. 290 (3): C917–24. doi:10.1152/ajpcell.00401.2005. PMID 16267105. ↑ Bianchi ME (2009). "HMGB1 loves company.". J Leukoc Biol. 86 (3): 573–6. doi:10.1189/jlb.1008585. PMID 19414536. ↑ Hreggvidsdóttir HS, Lundberg AM, Aveberger AC, Klevenvall L, Andersson U, Harris HE (2012). "High mobility group box protein 1 (HMGB1)-partner molecule complexes enhance cytokine production by signaling through the partner molecule receptor". Mol. Med. 18: 224–30. doi:10.2119/molmed.2011.00327. PMC 3320135 . PMID 22076468. ↑ Lotze MT, DeMarco RA (December 2003). "Dealing with death: HMGB1 as a novel target for cancer therapy". Curr Opin Investig Drugs. 4 (12): 1405–9. PMID 14763124. Thomas JO, Travers AA (2001). "HMG1 and 2, and related 'architectural' DNA-binding proteins.". Trends Biochem. Sci. 26 (3): 167–74. doi:10.1016/S0968-0004(01)01801-1. PMID 11246022. Andersson U, Erlandsson-Harris H, Yang H, Tracey KJ (2003). "HMGB1 as a DNA-binding cytokine.". J. Leukoc. Biol. 72 (6): 1084–91. PMID 12488489. Erlandsson Harris H, Andersson U (2004). "Mini-review: The nuclear protein HMGB1 as a proinflammatory mediator.". Eur. J. Immunol. 34 (6): 1503–12. doi:10.1002/eji.200424916. PMID 15162419. Jiang W, Pisetsky DS (2007). "Mechanisms of Disease: the role of high-mobility group protein 1 in the pathogenesis of inflammatory arthritis.". Nature Clinical Practice Rheumatology. 3 (1): 52–8. doi:10.1038/ncprheum0379. PMID 17203009. Ellerman JE, Brown CK, de Vera M, Zeh HJ, Billiar T, Rubartelli A, Lotze MT (2007). "Masquerader: high mobility group box-1 and cancer.". Clin. Cancer Res. 13 (10): 2836–48. doi:10.1158/1078-0432.CCR-06-1953. PMID 17504981. Fossati S, Chiarugi A (2007). "Relevance of high-mobility group protein box 1 to neurodegeneration.". Int. Rev. Neurobiol. 82: 137–48. doi:10.1016/S0074-7742(07)82007-1. PMID 17678959. Parkkinen J, Rauvala H (1991). "Interactions of plasminogen and tissue plasminogen activator (t-PA) with amphoterin. Enhancement of t-PA-catalyzed plasminogen activation by amphoterin.". J. Biol. Chem. 266 (25): 16730–5. PMID 1909331. Wen L, Huang JK, Johnson BH, Reeck GR (1989). "A human placental cDNA clone that encodes nonhistone chromosomal protein HMG-1.". Nucleic Acids Res. 17 (3): 1197–214. doi:10.1093/nar/17.3.1197. PMC 331735 . PMID 2922262. Bernués J, Espel E, Querol E (1986). "Identification of the core-histone-binding domains of HMG1 and HMG2.". Biochim. Biophys. Acta. 866 (4): 242–51. doi:10.1016/0167-4781(86)90049-7. PMID 3697355. Ge H, Roeder RG (1994). "The high mobility group protein HMG1 can reversibly inhibit class II gene transcription by interaction with the TATA-binding protein.". J. Biol. Chem. 269 (25): 17136–40. PMID 8006019. Parkkinen J, Raulo E, Merenmies J, Nolo R, Kajander EO, Baumann M, Rauvala H (1993). "Amphoterin, the 30-kDa protein in a family of HMG1-type polypeptides. Enhanced expression in transformed cells, leading edge localization, and interactions with plasminogen activation.". J. Biol. Chem. 268 (26): 19726–38. PMID 8366113. Zappavigna V, Falciola L, Helmer-Citterich M, Mavilio F, Bianchi ME (1996). "HMG1 interacts with HOX proteins and enhances their DNA binding and transcriptional activation.". EMBO J. 15 (18): 4981–91. PMC 452236 . PMID 8890171. Xiang YY, Wang DY, Tanaka M, Suzuki M, Kiyokawa E, Igarashi H, Naito Y, Shen Q, Sugimura H (1997). "Expression of high-mobility group-1 mRNA in human gastrointestinal adenocarcinoma and corresponding non-cancerous mucosa.". Int. J. Cancer. 74 (1): 1–6. doi:10.1002/(SICI)1097-0215(19970220)74:1<1::AID-IJC1>3.0.CO;2-6. PMID 9036861. Rasmussen RK, Ji H, Eddes JS, Moritz RL, Reid GE, Simpson RJ, Dorow DS (1997). "Two-dimensional electrophoretic analysis of human breast carcinoma proteins: mapping of proteins that bind to the SH3 domain of mixed lineage kinase MLK2.". Electrophoresis. 18 (3-4): 588–98. doi:10.1002/elps.1150180342. PMID 9150946. Jayaraman L, Moorthy NC, Murthy KG, Manley JL, Bustin M, Prives C (1998). "High mobility group protein-1 (HMG-1) is a unique activator of p53.". Genes Dev. 12 (4): 462–72. doi:10.1101/gad.12.4.462. PMC 316524 . PMID 9472015. Milev P, Chiba A, Häring M, Rauvala H, Schachner M, Ranscht B, Margolis RK, Margolis RU (1998). "High affinity binding and overlapping localization of neurocan and phosphacan/protein-tyrosine phosphatase-zeta/beta with tenascin-R, amphoterin, and the heparin-binding growth-associated molecule.". J. Biol. Chem. 273 (12): 6998–7005. doi:10.1074/jbc.273.12.6998. PMID 9507007. Nagaki S, Yamamoto M, Yumoto Y, Shirakawa H, Yoshida M, Teraoka H (1998). "Non-histone chromosomal proteins HMG1 and 2 enhance ligation reaction of DNA double-strand breaks.". Biochem. Biophys. Res. Commun. 246 (1): 137–41. doi:10.1006/bbrc.1998.8589. PMID 9600082. Claudio JO, Liew CC, Dempsey AA, Cukerman E, Stewart AK, Na E, Atkins HL, Iscove NN, Hawley RG (1999). "Identification of sequence-tagged transcripts differentially expressed within the human hematopoietic hierarchy.". Genomics. 50 (1): 44–52. doi:10.1006/geno.1998.5308. PMID 9628821. Boonyaratanakornkit V, Melvin V, Prendergast P, Altmann M, Ronfani L, Bianchi ME, Taraseviciene L, Nordeen SK, Allegretto EA, Edwards DP (1998). "High-mobility group chromatin proteins 1 and 2 functionally interact with steroid hormone receptors to enhance their DNA binding in vitro and transcriptional activity in mammalian cells.". Mol. Cell. Biol. 18 (8): 4471–87. doi:10.1128/mcb.18.8.4471. PMC 109033 . PMID 9671457. Wu H, Wu T, Han X, Wan J, et al. (2016). "Cerebroprotection by the neuronal PGE2 receptor EP2 after intracerebral hemorrhage in middle-aged mice.". J Cereb Blood Flow Metab. doi:10.1177/0271678X15625351. PMID 26746866. Jiao Y, Wang HC, Fan SJ (December 2007). "Growth suppression and radiosensitivity increase by HMGB1 in breast cancer". Acta Pharmacol. Sin. 28 (12): 1957–67. doi:10.1111/j.1745-7254.2007.00669.x. PMID 18031610.